In the midst of vacation planning, a frequent winter travel question is: sun or snow? I think we should add another category to the list of holiday possibilities: storm? As in storm watching. Vancouver Island’s Tofino has become a mecca for adventure seekers in winter. 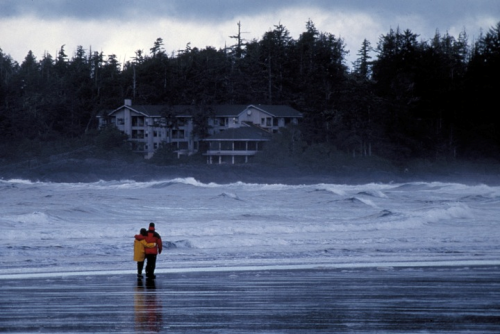 Here’s why to consider booking a Tofino storm watching holiday. Tofino, on Vancouver Island, has prided itself for some time on the awe-inspiring natural beauty of its location, on the (nearly) most western point of Canada. It’s been known as a summer destination for many years—popular with surfers, whale-watchers, campers, sightseers and nature enthusiasts who enjoy its beauty as well as its laid-back and quirky village charm. 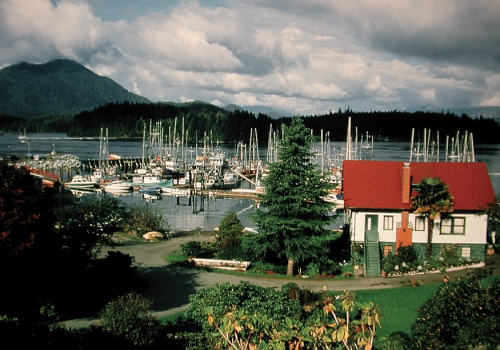 Tofino has grown tremendously in the past twenty years. It has become a major tourism destination on Vancouver Island, with luxury resorts, award-winning restaurants, and all of the trappings of a busy resort town. It can feel quite crowded in the popular summer months—less of a get-away-from-it-all kind of place, than an everyone-and-their-dog-is-here kind of place. In the past, Tofino used to shut down after Thanksgiving. Stores, hotels and restaurants closed and the village returned to the locals during those quiet winter months. Then, maybe ten or so years ago, Tofino realized it didn’t have to be just a one-season tourist town any longer. It had a unique winter attraction that few destinations could match: storm season along the Pacific. 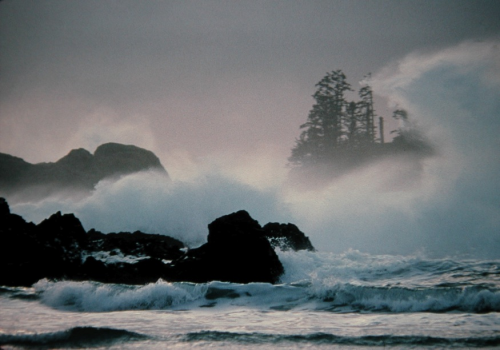 Hence, Tofino’s storm watching as tourism was born. The storm watching season extends from November to March, with the peak period being December to February. 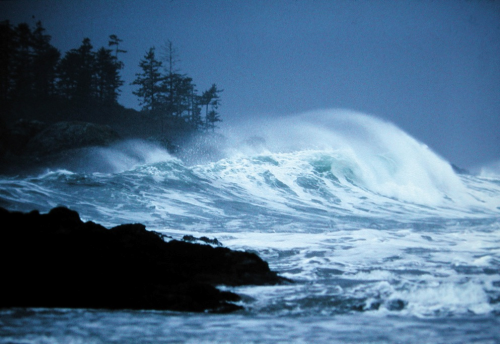 Tofino gets between 10 to 15 good winter storms a season. Coupled with five metros (nearly 16 and a half feet) of annual rainfall, that makes for some serious weather that lends itself to watching those crashing waves hit the beach from a warm, indoor fire-side seat. My family’s first experience with Tofino storm-watching was more close up. We were camping in early October for Canadian Thanksgiving a few years ago when the skies let loose with monsoon-like rains as soon as we finished pitching the tent. Halfway throughout the night we built a moat to keep the water from entering the tent, which held…just barely. By dawn, we were exhausted and defeated—ready to give up for the warmer, dryer shelter of the Storm Suite at the local B&B on Chesterman Beach. There are many accommodation options in Tofino. One of the original family beach resorts is the Pacific Sands Beach Resort. Like many of the hotels and resorts here, they have options for rooms or autonomous suites, which provides a good range of price options. Pacific Sands is on Cox Bay Beach, which is an amazing crescent of sand that ends at Pacific Rim National Park Reserve. 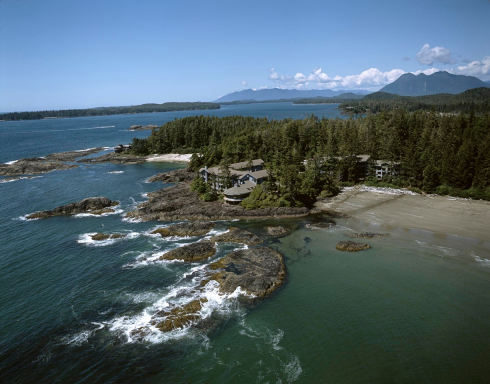 There are two other resorts on Cox Bay that are both family friendly too: Cox Bay Beach Resort, which provides amazing suites; and the somewhat oddly named Long Beach Lodge Resort. For a more luxurious getaway, the Wickaninnish Inn, (or the ‘Wick’) is outstanding. Perched overlooking Chesterman Beach, it provides impeccable accommodation, service, food, and of course, stunning views of the ocean. If you really want the full immersion West Coast experience, you will have to consider testing the waters yourself. That means surfing! You can surf year-round in the Tofino area, wearing a wetsuit in winter, of course. Pacific Surf School and Surf Sister are the most established schools, and Bruhwiler Surf School is another great option. Kids are not just allowed, they are encouraged to get on a board, and often teach adults a thing or two about balance and stamina on the water. Have you ever been storm watching on your travels? Share your experiences and comments! All photos courtesy of Wickaninnish Inn. I didn’t know that Tofino was popular for storm watching but it certainly makes sense after seeing those photos of the waves! Have heard of Wickaninnish though and have always thought that it would be a beautiful place to stay. Claudia, I remain surprised that you’ve never added Ucluelet into the mix!! Ucluelet has a recently (mostly) completed Wild Pacific Trail while lops along craigs and down into the beaches right along the coast, it even has a storm watching platform (the ocean was sadly calm both days I was out there, it was even sunny!). They’re hoping to eventually link it in with the trail that runs through Long Beach National Park. Those are great shots too. I love the very wild west coast, there’s something about the scraggly trees, non-stop wind and crazy surf that makes my heart twitter pated. From your description Allison, I think that Ucluelet deserves an article all on its own. We’re overdue for a trip there, and would love to profile it after a decent visit to discover how much it’s changed. The natural beauty of both places is just stunning – rain or shine! Oh wow, this is an amazing island and it is really looking like “on the edge of the world”. Photos are beautiful I like these waves and I’m thinking now to visit it for the winter. Thank you once again for the great article.